In the early 1980’s, the phone rang in our small office. It was a local garden hose manufacturer, and he had a problem. The round printed cardboard disc that was to be placed inside a hose reel was missing something. “Made in Canada” was required and somehow the printer had forgotten to include this. The gentleman now had thousands of expensive printed and die cut wraps that he could not use. “Any suggestions?” he asked. It took only a split second to solve his problem. The Heidelberg platen! Certainly, there were other possibilities. The Kluge, Victoria or Chandler & Price (with feeder) could do it, but there was an easier way: The Heidelberg. Problem solved. The T platen could feed and deliver virtually anything. From one-up business cards to folded signatures, thin stitched booklets, odd shaped labels, and yes, even a cardboard round wrapper for garden hose. The platen came with everything. Initially, there were no options one could buy. Two chases, small size kit, two-up kit, odd shape kit, die-cutting plate and ink knife were all included as standard. The Tiegel prototype was first introduced to the world 100 years ago during the 1914 Bugra (Austellung Buchgewerbe Und Graphik) exhibition in Leipzig. By the end of the production in 1985, Heidelberg has produced more than 165,000 T platens. Since the creation of metal type, there has never been such a successful machine as the Heidelberg platen. 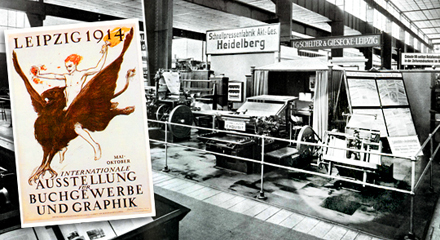 Schnellpresse, as Heidelberg was called in the early days, built their business around this press. Platens were sold all over the world and when it was time to stop, in 1985, more than 165,000 “T” platens were delivered. There was of course, competition. The British Thompson was a close facsimile of the Heidelberg - especially before WW II when Thompson used the same rotary gripper system. That ended abruptly after WW II. Later, the Czechoslovak Grafopress appeared as an almost identical clone. Some suggest this is when Heidelberg started to use the term “Original Heidelberg” to disassociate themselves from an Iron Curtain country impervious to litigation. I rather doubt that. The word “Original” was often used by German builders and Schnellpresse probably did too even before the Czech copy. We called the Grafopress the "Scrap-o-Press" as it was nowhere near as good a machine. Grafopress did have one feature that was incorporated into the Heidelberg though. The ability to lock out the forme rollers was eventually, years later, designed into the Drupa 1967 Heidelberg. Both the Soviet Union and China also made knock-offs of the Heidelberg, both very poor copies. Over the years, we hauled Heidelberg platens out of and into basements, through windows, into garages, or stripped down to get through narrow doorways. There seemed no place existed where a Heidelberg could not go. Our company overhauled and sold so many - I lost track. When crash numbering was at its apex, it was not uncommon to see one operator in control of four presses. He could hear exactly what the machine was doing while busy loading and unloading feeders and deliveries. 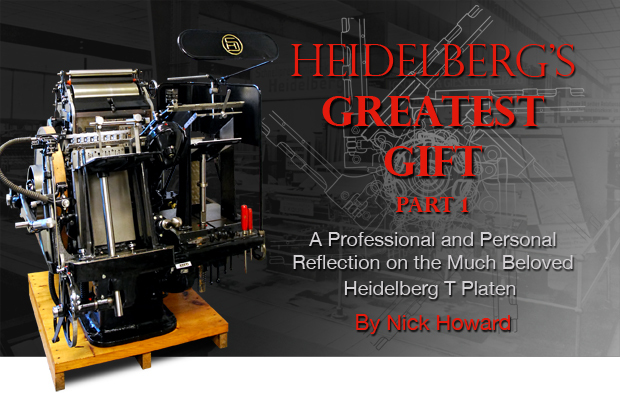 As safety concerns increase,d the Heidelberg platen faced many challenges. Some “T’s” found themselves encapsulated under plexiglas and wire mesh, just to keep the authorities at bay. Eventually, it became impossible to operate these presses in such situations. Greeting card companies that may have had 10+ machines soon started to discard the platen. This amazing and still relevant machine was born around 1912 when Schnellpressenfabrik-Heidelberg purchased the patents from a Köln print shop owner and tinkerer - Karl Gilke. 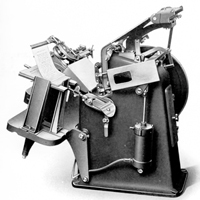 Not much is known about Gilke, but the platen with the “propeller-gripper” changed the world. Prior there existed essentially hand-fed platens. These machines, while labor intensive, were slow. Every sheet had to be fed and delivered by hand. Gilke changed all that by using the favored “Boston Principle” (a platen that has a stationary bed) and incorporated both feeder and delivery into it. Back in 1896, the Harris Brothers, of Niles, Ohio, developed a similar game changing press in the E1 rotary card press. It had a unique shuttle feeder and could run at an astounding 15,000 sheets/hour. But, because the E1 was rotary, it required a stereo plate (curved lead cast plate common on letterpress newspaper presses). This was the Achilles heel and why the Harris E1 failed to make near the impact as Heidelberg. Small print shops used type and printers could not afford the costs of stereos and the machinery needed to make them. In 1921, Robert Miehle, an American, came out with his revolutionary “Vertical Miehle”. This press, later called the V-36 for the running speeds of 3,600 s/hr., was a cylinder in a vertical incline. Something rather different. It was well received, and had a bigger sheet size of 14" x 20" as compared to Schnellpresse’s 10" x 15". But, the vertical was also a harder press to run and make-ready. The Heidelberg platen was so quick to set up and feed - it ran circles around the Vertical. Only when run lengths were bigger or the sheet size increased did the Platen loose some of its advantage. Even before WW II, it was common to see both the Vertical and the platen in the same shop. One’s weakness was the others strength and this remained for the life of letterpress in a commercial environment. Schnellpressenfabrik Heidelberg has roots going back to 1850. 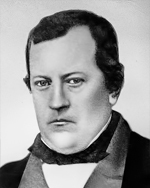 Andreas Hamm and Andreas Albert had joined forces in 1863. Hamm owned an iron foundry specializing in bells. While Albert was a foreman at C. Reichenbach’s Press Works in Augsburg (later to become MAN). But, the two had a falling out, and Hamm continued with his own company. Albert, on the other hand, formed his own company - Albert & Cie, which grew also exponentially. 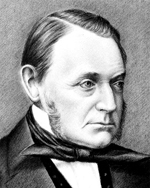 After Hamm’s passing in 1894, his son sold the company to Wilhelm Müller. Not much happened at Schnellpresse during the years 1873 to 1912, but press developments saw the rise of some powerful players. VOMAG, Koenig & Bauer, MAN, Maschinenfabrik Johannisberg-Geisenheim (MJG), Dresdner Schnellpressenfabrik - Coswig (Planeta) and Hamm’s former partner Albert & Cie. All became major builders of mostly cylinder presses. Tiny Schnellpress made facsimiles of the standard German stop cylinder press too. Although Schnellpresse released the “Exquisit” cylinder in 1921, there was no magic in this press. Gilke’s design was the one and only watershed moment for Schnellpresse. German platen presses were all mostly knock-offs of the American Gally parallel impression design. At least, 20 companies were making very good versions of this press. Victoria being the most well-known. Any developments to automate feeding and delivery were all band aid approaches with discombobulated devices affixed to an already mature hand-fed platen design. Schnellpresse knew that if they could make their little platen work, it would rip apart the whole industry. Even back in the early 20th century, the majority of printers were small shops. Not everyone wanted or could afford the large cylinder presses. Jobs were mostly handled one or two-up on smaller hand-fed platen presses. If Heidelberg could make a press that could feed and deliver easily, the world would come calling.